DACHAU, Germany, May 3 (Reuters) - Germans will never forget the "unfathomable horrors" that the Nazis inflicted at the death camps, Chancellor Angela Merkel said on Sunday at a ceremony marking the 70th anniversary of the liberation of the Dachau concentration camp near Munich. In a moving speech to 120 elderly survivors from 20 nations and six U.S. soldiers who helped liberate the camp, Merkel said Dachau and other death camps freed near the end of World War Two stand as eternal reminders of the Nazi regime's brutality. 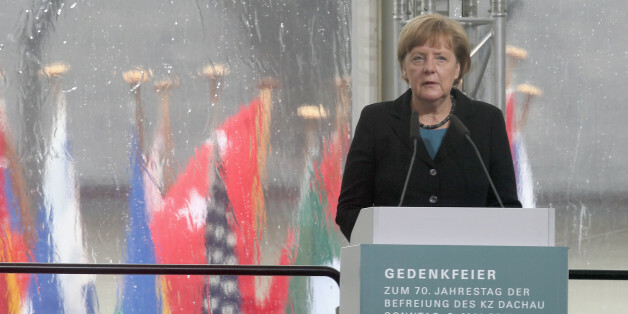 "These former concentration camps have come into public focus in recent weeks with the passing of the 70th anniversaries of the liberation of one camp after another," Merkel said in a somber ceremony at Dachau, now a memorial with 800,000 annual visitors. "There were unfathomable horrors everywhere," said Merkel, who in 2013 became the first German leader to visit Dachau. "They all admonish us to never forget. No, we will never forget. We'll not forget for the sake of the victims, for our own sake, and for the sake of future generations." The Nazis set up Dachau in March 1933, weeks after Adolf Hitler took power, to detain political rivals. It became the prototype for a network of camps where 6 million Jews were murdered, as well as Roma, Russians, Poles and homosexuals. More than 200,000 people were being held in the camp when U.S. troops liberated it on April 29, 1945. Television footage from Dachau, showing starved inmates and piles of bodies, was among the first images the world saw of the Holocaust. "It was a terrible shock, but we will never forget your excitement as you hugged us and brought out a hand-sewn American flag you hid for the occasion," said a former U.S. soldier, Alan Lukens. "The Nazis could not crush your spirit." Jean Samuel, a French resistance fighter, said he felt like a human again on the day the Americans arrived. "It was the best day of my life," he said. "The nightmare was finally over." The main gate with its cynical slogan "Arbeit macht frei" (Work sets you free) was rebuilt by a local blacksmith after the original was stolen last year. Merkel said it was alarming that the gate was never found. She also lamented that Jewish institutions need round-the clock police protection in Germany. "These camps keep our memories alive, despite all the adversity out there," Merkel said. "There are unfortunately incidents again and again such as the theft of the Dachau gate last year that are disturbing."